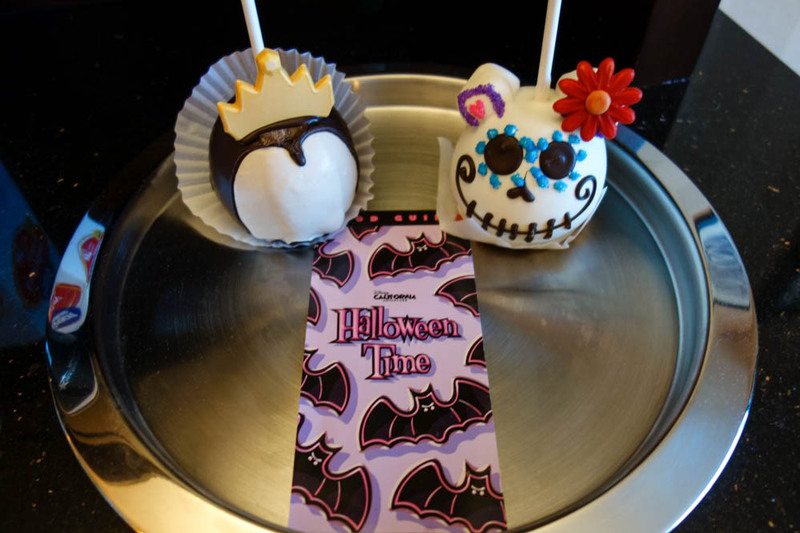 Disneyland Halloween Sweets: Tricks or Treats? 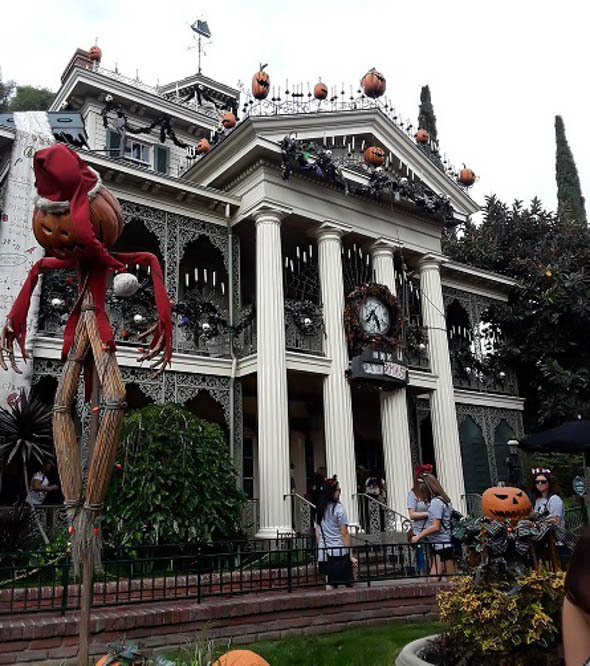 I recently returned from a week at the Disneyland Resort, and while I was there, I made it my mission to try as many of their special Halloween treats as I could. As we all know, nobody does a holiday like Disney, and their Halloween celebration is exceptional. I only wish my time and budget had allowed me to eat one (or two) of everything they offered. Since that wasn’t possible, I focused on several treats that allowed me to indulge my sweet tooth. Here are the verdicts on each one that I tried. I’m rating the treats on a one to five scale. One being don’t bother…five being buy two of these, they’re that good. First up: caramel apples. Disney offers multiple apples for Halloween, and they all look amazing. 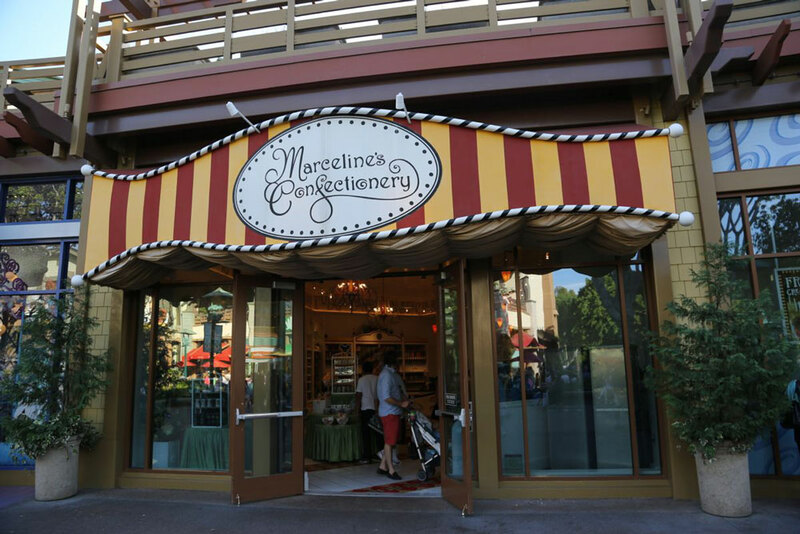 I loved watching the candy makers in the window at Marceline’s Confectionery in Downtown Disney make magic, as they dipped and decorated each apple by hand. They’re mesmerizing, and they work so quickly! I was very impressed. Overall, the apples get a five. They are all delicious and well worth the purchase. Since I felt some were better than others, I rated each one we bought. 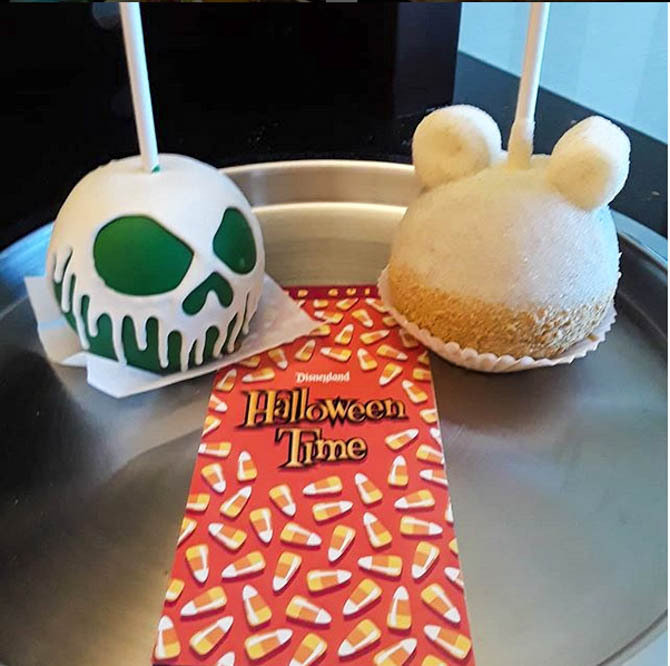 So, we (my family was with me) tried the Snow White Poisoned apple, the Apple Pie apple (technically not Halloween-themed, but I associate apple pie with autumn, so I’m including it), the Day of the Dead apple, the Evil Queen apple, and the Minnie Witch apple (I didn’t get a photo of this one, sorry). The favorite overall was the Snow White Poisoned apple. It’s dipped in caramel, then covered with two layers of white chocolate to replicate the apple the Evil Queen made for Snow White in the movie. Delicious. We consumed this one in record time. The runner-up was the Apple Pie apple. This one is dipped in caramel, then white chocolate. Afterward, they roll the bottom half in cinnamon-sugar. It also has marshmallow Mickey ears. Very yummy. Third place was the Day of the Dead apple. It has the usual caramel base, then a hard marshmallow coating on top of that, with assorted milk chocolate pieces and decorations. The marshmallow coating was unusual and really good. It tended to shatter off the apple when eating it though, which was a bit messy. But as far as taste goes, it was very good. Fourth place was the Evil Queen apple. It was dipped in caramel, then dark chocolate, followed by white chocolate on her “face.” It was topped off with a gold-dusted white chocolate crown. I loved the dark chocolate on the apple, and the areas that had the additional layer of white chocolate on top of that were even better. Last place was the Minnie Witch apple. This had a caramel base, topped with milk chocolate, and the bottom half of the apple was then rolled in purple sugar. It also had marshmallow ears, and an orange and purple white chocolate witch hat on top. This was my least favorite, simply because it was a bit too sweet with the crunchy sugar coating. I also preferred the combo of dark chocolate and apple over milk chocolate. I still enjoyed the apple, just not as much as the others. So, all in all, the caramel apples get a huge thumbs up. Five for sure on the rating scale. Don’t miss them. They are pricey, ranging from approximately $11 to $15, depending on their complexity, but they do serve more than one person, so take that into account. We cut ours into wedges with a plastic knife in our hotel room, and it worked just fine. Great late night snack! Next up, we have a trio of treats from Jolly Holiday Bakery on Main Street USA in Disneyland Park. 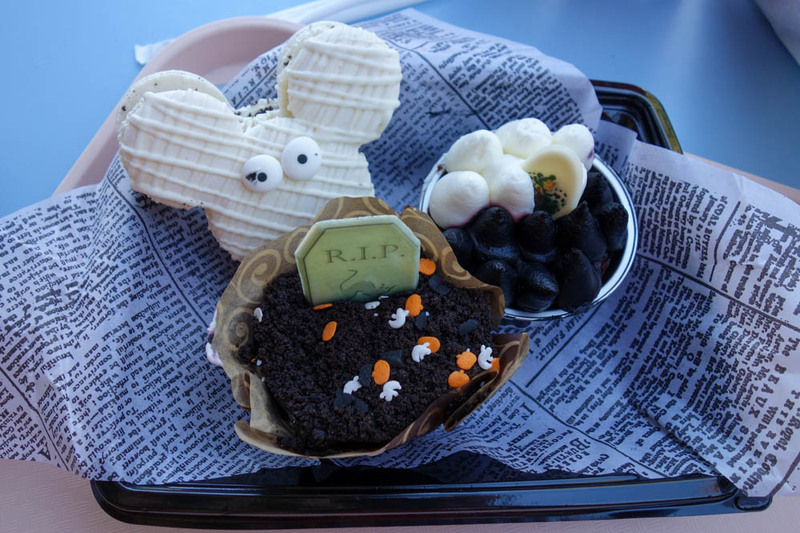 We tried the Mickey Mummy macaron, the Graveyard Cupcake, and the Cruella De Vil brownie. The Mummy macaron was adorable. The cookie part was vanilla, and the filling was Oreo flavored. Mickey also had two candy eyes, and was “wrapped” with vanilla frosting strips. And that’s all the good I can say about it. Holy cow, this thing was sweet! As in over-the-top, cloying, icky sweet. I needed a glass of water just to wash it down. We weren’t able to finish it. So, this earns a one. Don’t bother. Your $5.99 is better spent elsewhere. The Graveyard Cupcake ($6.99) is a chocolate cake with cherry filling, with a dark chocolate buttercream frosting. It’s topped with chocolate crumbles, Halloween sprinkles, and a white chocolate tombstone. Okay, this was delicious. Not too sweet, very rich, and chocolaty. I ate it all, and I would do it again. A big five on this one — so good. The Cruella De Vil brownie ($4.99) is a very dense brownie served in a very cute Dalmatian-spotted cup. It’s topped with white and black buttercream frosting, and a white chocolate piece featuring Cruella herself. This gets a three in my book. My boys liked it and ate most of it. I felt like the frosting to brownie ratio was a little heavy on the frosting side. Also, the black frosting is very black, and it stains your lips, mouth, teeth, and fingers accordingly. This brownie would be a nightmare in the hands of the five-and-under set. It’s very messy, and the idea of eating that much food coloring didn’t appeal to me. This brownie is adequate, and the idea is a good one, but I think you can find better options. 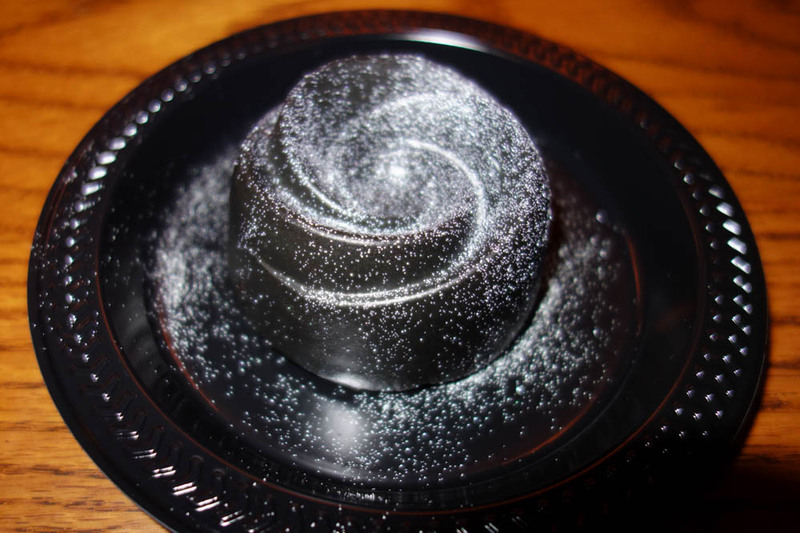 The last treat we tried was the Black Rose dessert at Red Rose Taverne in Fantasyland for $6.99. 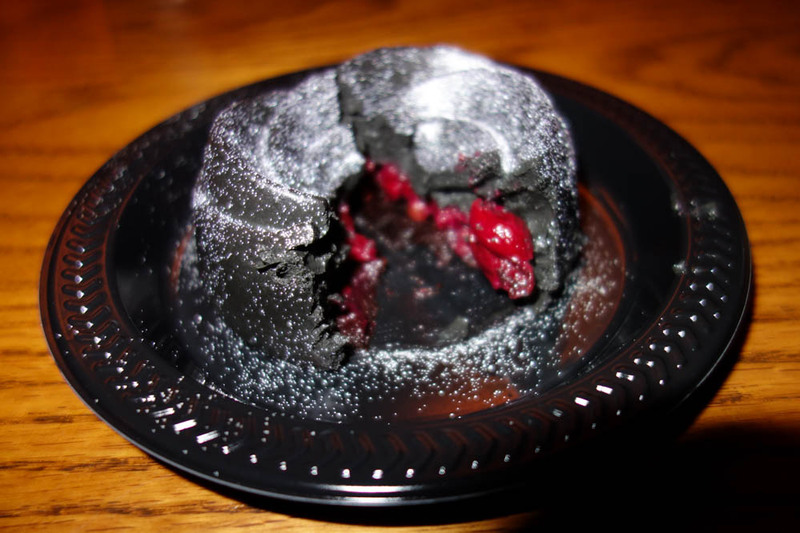 Disney describes this as a “black truffle mousse with raspberry compote and crunch center dusted with edible glitter.” I describe it as yummy. It was chocolaty rich, but not too heavy, and the raspberry center was a lovely contrast to the chocolate mousse. The base of the rose is a thin layer of chocolate cake, which also added texture and another punch of chocolate. The glitter didn’t really have a taste, and it’s a very fine grain. It made the rose look like it was sprinkled with pixie dust — entirely appropriate in my mind. I had no problem finishing this one on my own. A definite five for me. So, there you have it. 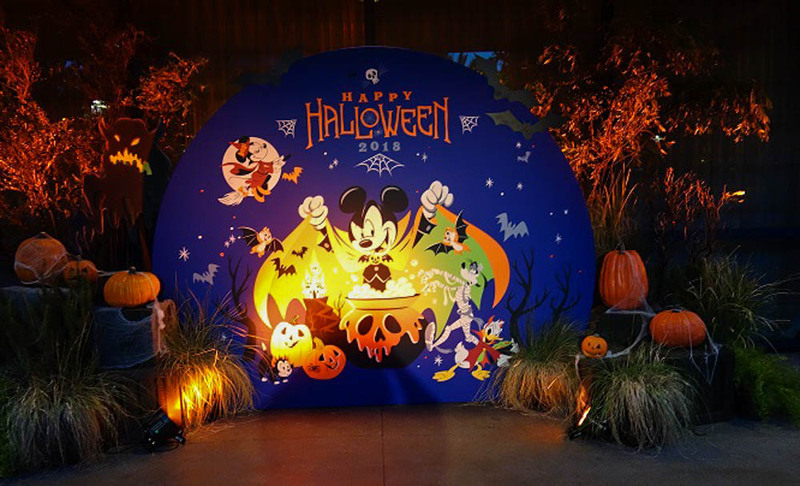 A small sampling of what Disneyland is offering this year for Halloween. 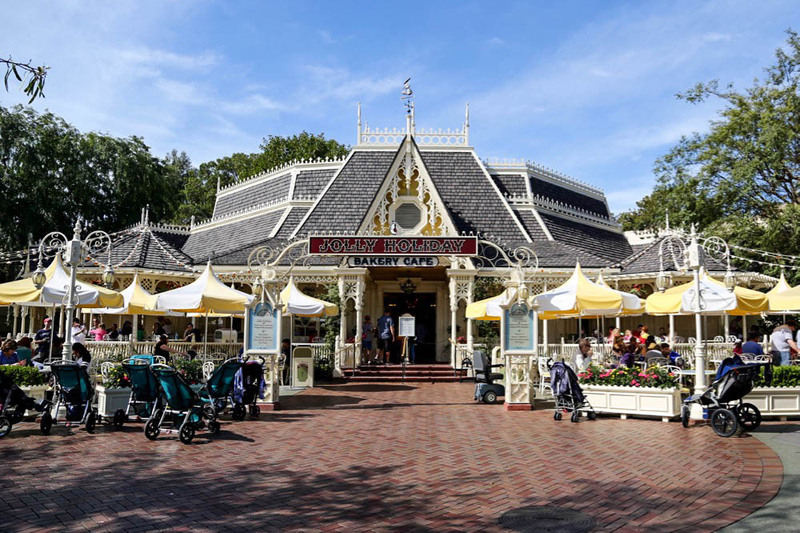 Hopefully you can find something to eat that adds to your enjoyment as you celebrate the holiday in the park! Let me know what you’re favorite Disney Halloween treats are. I’ll be sure to try them! About the Author: Diane has been a Disney addict since childhood, going to Walt Disney World shortly after it opened in the 1970s. Since moving out west, she has also become a huge fan of Disneyland as well. You can find her on Facebook and Twitter.